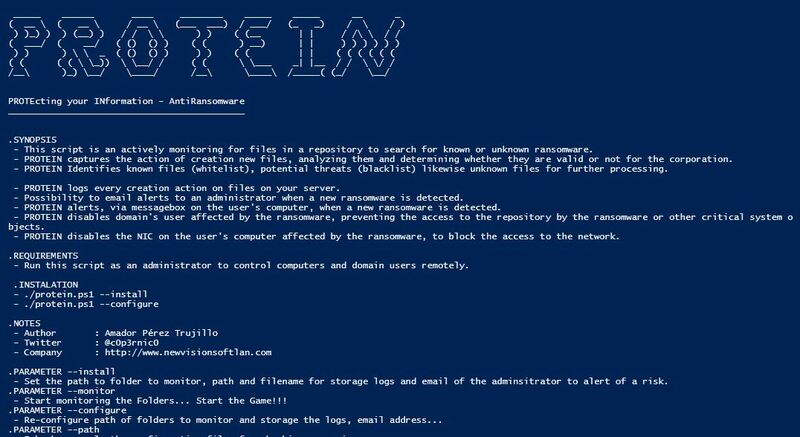 Browse: Home / Protein – Powershell Anti Ransomware. + PROTEIN captures the action of creation new files, analyzing them and determining whether they are valid or not for the corporation. + PROTEIN Identifies known files (whitelist), potential threats (blacklist) likewise unknown files for further processing. + PROTEIN logs every creation action on files on your server. + Possibility to email alerts to an administrator when a new ransomware is detected. 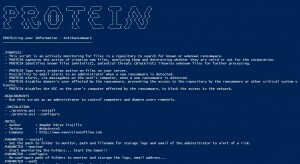 + PROTEIN alerts, via messagebox on the user’s computer, when a new ransomware is detected. 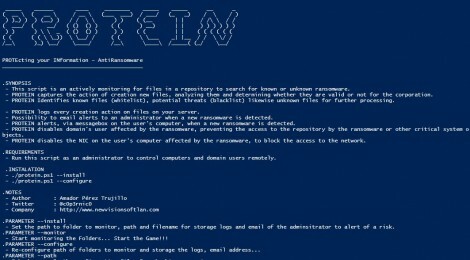 + PROTEIN disables domain’s user affected by the ransomware, preventing the access to the repository by the ransomware or other critical system objects. + PROTEIN disables the NIC on the user’s computer affected by the ransomware, to block the access to the network. – Run this script as an administrator to control computers and domain users remotely. .PARAMETER --install Set the path to folder to monitor, path and filename for storage logs and email of the adminsitrator to alert of a risk. IMPORTANT!!! Anti_malware_config folder MUST BE in c:\ on your File Server .PARAMETER --monitor Start monitoring the Folders... Start the Game!!! .PARAMETER --configure Re-configure path of folders to monitor and storage the logs, email address.. .PARAMETER --path Echo by console the configuration files for checking purposing. .PARAMETER --logs Echo by console the log file. Set the path to folder to monitor, path and filename for storage logs and email of the adminsitrator to alert of a risk. Start monitoring the Folders... Start the Game!!! Re-configure path of folders to monitor and storage the logs, email address..
Echo by console the configuration files for checking purposing. Echo by console the log file. ← winpayloads Charlie Dean updates – Undetectable Windows Payload Generation.